Songs, "Down to Earth," "Idea" and "Let There Be Love"
"It is all but impossible for a soaring enthusiast to view this film objectively; artistically and technically, "The Sun Ship Game" is the benchmark by which any other soaring film will be measured for years to come. " "The Sun Ship Game will serve as the standard against which to measure all attempts to convey soaring." "Nothing remotely like it has ever before been attempted.... No pilot watching the film could avoid sweaty palms"
Flying hundreds of miles a day through wild weather with no engine requires feats of airmanship unprecedented in human history and known before only to the birds. Soaring birds are able to accomplish these feats through instincts developed over millions of years. Humans are able to make these flights through strenuous mental effort, calculation and sensational feel for the air. 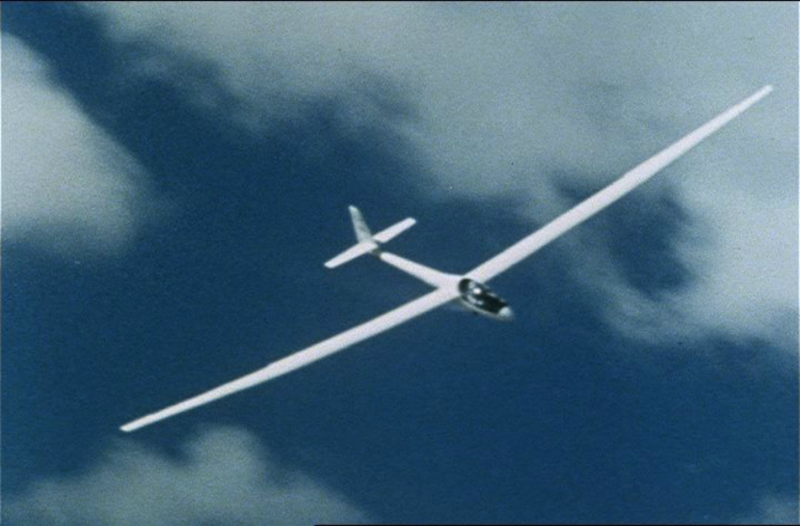 George Moffat and Gleb Derujinsky are great pilots and good friends who compete in the sport of soaring for speed and distance in aircraft without engines – sleek competition gliders. Both would like to win the 1969 U.S. Soaring Championship. “The Sun Ship Game” voyages through remarkable aerial photography with both pilots into the sky at a regional contest in Vermont and into wild weather with 83 other competitors in Marfa, Texas. Through eight days of hard flying in skies alternately filled with brilliant beauty and stormy violence, their two approaches arrive at a dramatic conclusion and one of them is named the U.S. Champion. “It was not easy for other pilots to strike me with awe. I had met hundreds in a lifetime of flying — Texas, Europe, and the world — planes with big engines, small engines, multi engines, jet engines. “The pilots who finally struck me with awe flew with no engine at all. “George Moffat and Gleb Derujinksy were pilots of sleek aircraft that had no mechanical power. They were always falling through the air. Yet they could keep their ships aloft all day and soar high and hundreds of miles. “How they could do that seemed to me amazing, miraculous, a great mystery. As I looked into this mystery I realized that the power to soar was in their cockpits. It was in their minds. And their engine was the sun, most powerfully, heart from the fierce Texas sun. “Capturing that life, often transparent and invisible, was a challenging and beautiful achievement that combined intuition, calculation and sensational feeling. Derujinsky relies most on feel and creative impulse to sense his way through invisible air currents. Moffat does the same but relies more on a hand calculator he constantly works in the cockpit. One way or another, these pilots were keepers of a compelling mystery and masters of a wild domain most human beings could hardly imagine. “Being human, Moffat and Derujinsky and pilots like them of course introduced human competition into the beauty of their soaring. They were vying with one another across the globe to see who could fly faster and farther, for championships of nations and of the world. “Moffat and Derujinsky were about to clash in a regional contest in Vermont, leading to the national competition in Texas — 85 pilots soaring in wild air for the championship of the United States. “For me this appeared an opportunity to make a film that would reveal that wild domain and look deeply into the beauty and humanity of its compelling mystery. “The films I make are called Cinema Verite and require the camera to be with people through experiences wherever they might be. For this film I had to assemble a group of photoships carrying 16mm cameras loaded with color reversal film, stabilized by suspension mounts and gyro controlled lenses that would dampen vibrations from air that was always thunderously rough in the midst of a hot Texas day. The first photoship was a four-passenger Bill helicopter with a side door that would disappear to offer a wide view to an intrepid cameraman seated on teh floor with his feet dangling out in the wind. The helisopter was good for circling thermals and recording gliders climbing and peeling out the top. But when gliders dived out on course they left the helicopter far behind. Then it was the turn of our Piper Cherokee 6 low winged monoplane, also with an open side and mounted cameras, which could keep up with the cruising gliders. For shooting within thermals we used a Schweitzer 232 as a photoship, with small cameras in the hands of a cameraman shooting thorugh the canopy and an arriflex camera mounted in the nose triggered by the pilot, good also for shooting forced landings in Vermont. Finally, from time to time Derujinsky and Moffat triggered cameras installed to photograph in and from their cockpits. We had arriflexes with long lenses and special Drew Associates cameras modified for lightweight and silent operation for photographing people candidly on the ground. Managing all this were Mike Jackson, Anne Gilbert and Dan Drasin supported by Thatcher Drew and a crew of photographers headed by Peter Powell, Abbot Mills and Walter Helmuth. George Moffat, holding hands with wife Suzanne, discusses the day’s competition. 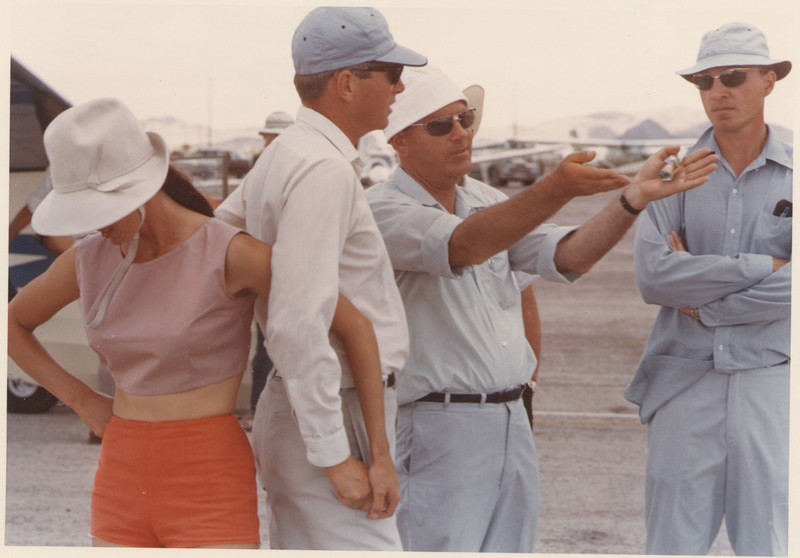 “The Sun Ship Game, Bob Drew’s remarkable documentary of the 1969 Nationals in Marfa, Texas, has long been the best-ever film of what competition soaring is all about. In it he captures not only the beauty of soaring but also the dramatic aspects of the competition and the tensions between the leaders, their differing philosophies, and their wives, families and crews. This film has long been unavailable, either in the original or the faulty VHS cassettes version released in the ’80’s. “Now Bob Drew has taken the original master and professionally converted it to DVD. I recently saw the result, and it is breathtaking as to color, sound and clarity. Since I have seen the film a dozen or more times over the years, I hadn’t expected to be so emotionally affected over the DVD version. Perhaps the first thing I noticed was the color of the opening sequence in the Vermont valleys, remarkably vivid compared to the faded cassette or film version. It was also apparent in the stark scenery of Marfa, with its vast unlandable distances, and excellent thunderstorm shots. I did the flying for most of the thunderstorm scenes, and the sharp color and clarity brought them vividly back to life. The music, too, with the excellent and then unknown Bee Gees, seemed clearer and sharper, particularly in the thermal music that signaled a found thermal at low altitude or the sad theme that indicates that winners also require losers. “One of the particular strong points of the film was the conflicting personalities and techniques of the leaders, Gleb Derujinsky, Wally Scott and me. Bob Drew, foremost American practitioner of cinema verite, made excellent use of close-ups, particularly of tired post-contest day faces, that come across particularly well in the DVD format. Nothing in this film was staged, by the way, everything you see, all the words spoken, were filmed as it happened.